Hydroelectricity and wind-generated power met the bulk of the State’s energy needs at 71 per cent. 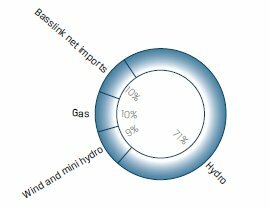 Tasmania imported a total of 1,783 GWh electricity from interstate generators via the Basslink cable, representing 10 per cent of the State’s total demand. a single wind turbine in the North-west. The average electricity consumption per household in Tasmania over 2009-2010 was 25.75 kWh per day. This page was last modified 04:44, 23 March 2011.